WBC super flyweight world champion Srisaket Sor Rungvisai (43-4-1, 39 KOs) dealt former multiple world champion Roman “Chocolatito” Gonzalez (46-2, 38 KOs) a terrible defeat in knocking him out in the 4th round on Saturday night in the main event of the “SuperFly” Card on HBO Championship Boxing at the StubHub Center in Carson. California. Rungvisai was hitting Gonzalez at will with huge power shots in rounds 1-3. In the 4th, Rungvisai knocked Gonzalez down hard with a big shot to the head. Gonzalez got back up but was quickly knocked down a second time. 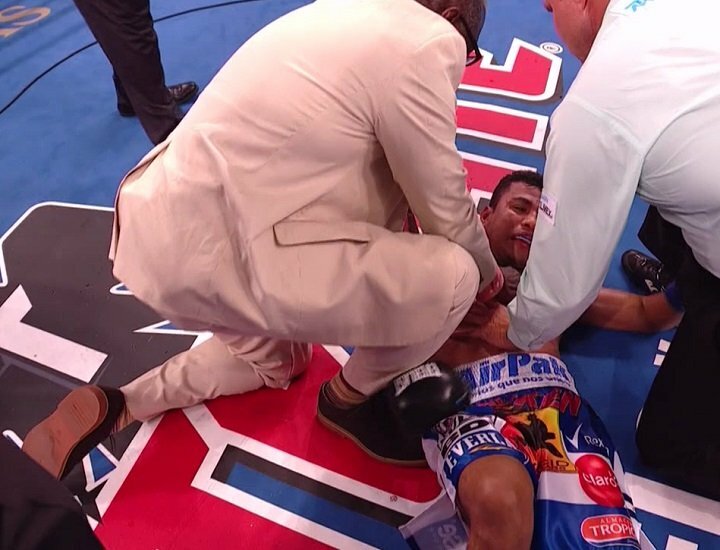 This time there would be no getting back up for “Chocolatito,” as the referee Tom Taylor stopped the fight at 1:18. Gonzalez was not going to be able to get back up to continue fighting even if he wanted to. He was hurt, lying on his back and staring up at the ceiling. There nothing competitive about the fight. Rungvisai was unloading on Gonzalez in the first 3 rounds, and making a lot of noise each time he would land. The impact of Rungvisai’s shots to the head of Gonzalez was brutal. Rungvisai was hitting Gonzalez with shots that you would expect from a lightweight, not a super flyweight. But in looking at how big Rungivisai was after he rehydrated, he looked like a lightweight. For his part, Gonzalez still looked like a guy that belongs in the flyweight division. He was too small to be inside the ring with Rungvisai, and it was the same situation in the first fight. The fact that Gonzalez was able to hang with Rungvisai and lose a 12 round decision last March in fight No.1 between them is a testament to the huge talent of Gonzalez. But it was a size mismatch. The victory for Rungvisai, 30, closes the show for the 2-fights between him and Gonzalez once and for all, I hope. Rungvisai needs to move on to face guys that are more his size at super flyweight like WBO super flyweight champion Naoya Inoue. Juan Francisco Estrada is now Rungvisai’s mandatory challenger after he beat Carlos Cuadras tonight. He’s an option for Rungvisai as well. I think the fans would like to see a unification fight between Rungvisai and Inoue. I’m not sure if Inoue’s management is interested in a fight against Rungvisai. It would have been better or Inoue if Gonzalez had beaten Rungvisai, as he’s a bigger name than Rungvisai. Gonzalez vs. Inoue would play out well in Tokyo, Japan. I don’t think Inoue-Rungvisai is nearly as big. Gonzalez’s next move with his boxing career will be interesting to see. I don’t know what he’s going to do. If he stays at 115, he’ll likely get bludgeoned by the bigger fighters in this weight class no matter who he faces. If Gonzalez moves back down to the flyweight division, he could do well, as long as his punch resistance is still there. You never know. Gonzalez took a career’s worth of hard shots in his last 3 fights against Rungvisai and Cuadras. It was not a smart move on Gonzalez’s part to move up to super flyweight. Hopefully, it’s not too late for him to realize that mistake and move back down to 112.